We’re looking forward to the Super Bowl this weekend. My husband patiently explains much of the game to me as it progresses. Football is filled with lessons that can help us understand other facets of life and politics. 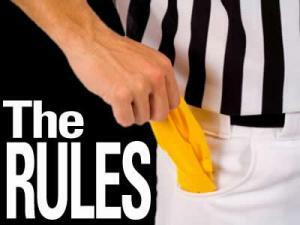 Intentional grounding is when the quarterback throws away the ball on purpose to avoid being tackled and losing yards. There is a reasonable for this rule against such action, because it reflects poor sportsmanship to purposely throw the ball away when everyone knows there is no receiver available. The team is supposed to try another play to regain those yards when they are better composed, not through rule breaking. This is how many people feel about our congress. We thought the vast majority of those elected were in favor of requiring our government to live within its means. Instead we ended up with a congress stocked up with spendthrifts—and there’s nothing thrifty about them. The fiscal irresponsibility is stunning. We should not be surprised when Democrats want to raise our taxes, because that fits with their party’s philosophy. We should be surprised when the Republicans allow it to happen. While many of them will explain that they were arm twisted into doing this, the steady increase in governmental size, scope, intrusion and expense could not have happened if the majority of the Republicans didn’t agree to go along with it. It seems like the Republicans who claimed to “take one for the team” were really just trying to take one for themselves. The “rank and file” legislative members of congress receive $174,000 annually. Everyone loves Santa Claus! I t’s hard to feel bad about the economy when there is so much to enjoy. Let’s admit it. It’s fun for congress to give gifts to others, especially when it costs them nothing. They enjoy feeling the love, but are not brave enough to do the hard parts. We can do better than this. When we expose the policies our governments use that drive up the cost of our welfare spending, we can move toward the direction of better ideas and save ourselves wasted tax dollars. Tonight on Missouri Grassroots Radio’s show, “Home Front”, I will be talking with Dr. Mike McManus, president of Marriage Savers. Mike will be talking about the economy and how the government has crafted policies that destroy marriage and exacerbate cohabitation, poverty and misery. Mike & Harriet McManus are Co-Chairs of Marriage Savers, a ministry whose goal is to help churches and communities cut their divorce rate and raise their marriage rate. They have helped the clergy of more than 200 cities adopt a Community Marriage Policy, an agreement across denominational lines, to make marriage such a priority in their churches that divorce rates fall. Here is a photo of some of my loyal supporters.